Crowdsourcing is an emerging technique adopted by companies in the process of innovation. It can be also adopted by university spin-offs that play the significant role in the process of knowledge and technology transfer. In recent years, they have been researched from diverse perspectives. However, there are hardly any studies based on university spin-offs that have implemented crowdsourcing. This chapter presents how crowdsourcing business model might be applied to develop a university spin-off. The paper explains the rationale behind the adaptation of crowdsourcing by innovation-driven spin-offs. One overarching question of the chapter is “Can crowdsourcing be well adopted by university spin-offs?” Our study will open new paths for research and discussion, and its results will be supportive for decision making in the context of innovation and entrepreneurship. The logic of this paper is to speculate how university spin-offs can create value with the groups of online users through adopting crowdsourcing in its operation. The creation of new companies from university, or the process of ‘spinning-off’, has received attention from a range of perspectives in recent years. They are not only to innovate, but also contribute to the productivity and creativity of a university (Hayter, 2013). The effects of the activity of academic spin-offs are well known in stories of the origin of the Silicon Valley and more recently in the biotechnology and IT industry (Chiesa& Piccaluga, 2000). The role of particular universities, such as Stanford and MIT in the USA or Cambridge in the UK, in these processes is also well documented (Rosenberg& Nelson, 1994). The attributes and the personality characteristics of academic entrepreneurs. The resource endowments and capabilities of the university. University structures and policies facilitating commercialization. Environmental factors influencing academic entrepreneurship. The development and performance of spin-offs. Studies that measure the economic impact of spin-offs on regional economies. Nowadays, information and creativity replaces material as the dominant currency, where stages such as product design, development and production are no longer solely the creation of business but can now be activated and accomplished by the crowd. Though it is hard to tell whether this revolution will ever enable individuals to completely overthrow large multinational corporations, however our analysis will help to assess the possible use of crowdsourcing in the spin-off environment. A key question guiding the paper includes: Can crowdsourcing be well adopted by university spin-offs? Our study will open new paths for research and discussion, and its results will be supportive for decision making in the context of innovation and entrepreneurship. The logic of this paper is to speculate how university spin-offs can create value with groups of customers and users via the web through adopting crowdsourcing in its operation. 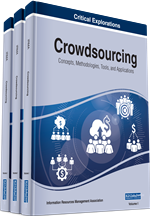 The term crowdsourcing has developed on the intersection of various disciplines (e.g. management, economy, sociology). It is therefore not a coherent term. The idea of outsourcing a task to the web-based community closely relates to other concepts in the social sciences such as prosumerism (Toffler, 1980), user-innovation (von Hippel, 1988), open-innovation (Chesbrough, 2003), co-creation (Prahalad and Ramaswamy, 2004). These terms, however, overlap with the crowdsourcing term (Brabham 2013; Estellés-Arolas & González-Ladrón-de-Guevara, 2012). In consequence, scholar discourse mixes with popular media discourse which indicates the dynamic increase in the popularity of that approach in all possible contexts.